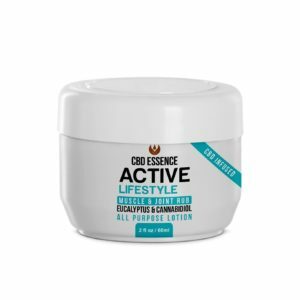 You can now buy Active Lifestyle CBD Topical Salve in a 2 oz bottle containing 600mg – perfect for soothing sore parts of your body. If you are looking for a pain reliever with a long-lasting effect, then this may be the product for you! Muscle strains: The pain associated with a pulled muscle is sometimes excruciating, especially if you enjoy being active. Active Lifestyle CBD Topical Salve will relieve you of pain, and the soothing effects are long-lasting. Just apply this lotion to the affected area and get the pain relief you need. Joint pains: These pains not only exclusive to the elderly, but can affect anybody. The CBD Active Lifestyle Topical Salve 600mg can relieve your joint pain when rubbed onto the affected area. Fractures and sprains: No-one should have to suffer through the pain of a broken bone or sprain. However, with this awesome lotion, you might be able to find some relief both in body and mind before heading to the doctor. Muscle soreness: After heavy exercise or an intense workout, you are likely to experience sore muscles. Nevertheless, you don’t have to bear the pain in your muscles even for a day. Just apply this effective lotion and get the relaxation you want immediately. Back pain: This is a common phenomenon in our millennial age, and it affects many people. But you don’t have to live through the ache – you may find that using Active Lifestyle CBD Topical Salve helps get rid of the pain. Inflammation: If you find yourself suffering with inflammation, whether that be a medical condition or a reaction, the CBD Topical Salve is a great solution. Its quick and easy to use – perfect to keep in your home. Quality: This CBD Topical Salve is made with eucalyptus and cannabidiol extracts, and which creates a synergistic pain removal formula. A great top-quality CBD product. Effect: It comes in a 600mg container and has hemp CBD oils which are naturally extracted and are therefore very effective. It also has eucalyptus oils which are also good anti-inflammatory oil. Very effective for people who live an active life and are prone to accidents and injuries. Price: From only $41, you can buy the CBD Topical Salve 600 mg online. All you need to do is to visit the official website or better still click on this link for a full review https://hempworldstore.com/cbd-essence-brand-review/. Final thoughts: With Active Lifestyle, you can live your active life worry free and enjoy all your daily activities knowing that CBD Topical Salve 600 mg have got you covered.